In 2016, of all the weather events to affect the nation, four stood out: a hurricane, a flood, a drought and a blizzard. These four were historic and extreme, setting numerous records and affecting large areas. Unfortunately, they caused a great deal of suffering and economic losses. Six other storm events, which were more localized, round out the top 10. Tornadoes were not among this year's most significant weather events. 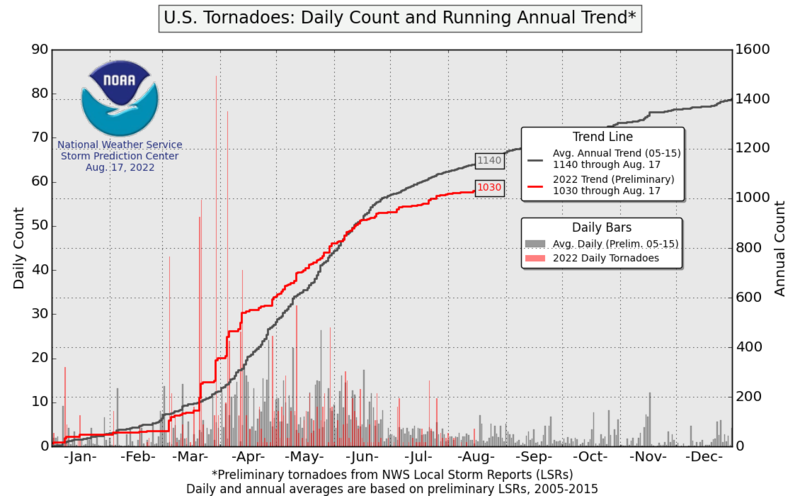 This year was, generally, a quiet year both in terms of the overall number of tornadoes and tornado fatalities. Much more than wind, in 2016, water (or, in one case, lack of water) caused the lion's share of weather-related deaths and damages. As seven of the top 10 weather events involved extreme rainfall, and several 1-in-1,000 year events, perhaps you could call it the year of the flood. Fuel tanks are seen after floodwaters rose because of Hurricane Matthew in Lumberton, N.C. This powerhouse storm hugged the coast from Florida to North Carolina, unleashing flooding rainfall, damaging winds and an ocean surge up to eight feet above normally dry land. North Carolina was hit by one of its worst flooding disasters on record. More than 15 inches of rain engulfed large areas in the eastern part of the state. First responders rescued more than 2,000 people stranded in high water, and more than 4,300 people were displaced. The storm was blamed for 28 deaths in the Tarheel state. Overall, the storm is estimated to have killed 49 people in the United States and produced economic losses of $4 to 6 billion. Louisiana flooding on Aug. 15. Between Aug. 10 and 17, nearly 30 inches of rain fell in parts of Louisiana, inundating neighborhoods and towns. Some of the worst flooding occurred around Lafayette and Baton Rouge. The rain was caused by a slow-moving area of tropical low pressure that drew record-setting amounts of moisture from the Gulf of Mexico inland. It produced three times as much rain in Louisiana as Hurricane Katrina. The end result was a multibillion-dollar flood that claimed 13 lives and destroyed 60,000 homes. Smoke rises above Gatlinburg, Tenn., on Nov. 29, the day after a wildfire destroyed numerous homes and buildings. A lack of rainfall that persisted over many months in interior portions of the Southeast resulted in extreme to exceptional drought conditions from central Mississippi to western North Carolina. Asheville, N.C., recorded its driest 75-day period on record, and Atlanta logged its longest period without measurable rain: 43 days. The tinderbox conditions helped wildfires spread rapidly in October and November. Tens of thousands of acres burned across several states, and the smoke compromised air quality. The worst fire, by far, ravaged Gatlinburg, Tenn., in late November, killing 14 people and destroying more than 2,400 structures. The resulting damage is estimated at over $500 million. This fire was man-made but spread explosively due to the dry conditions. Ninth and I streets in D.C. during Snowzilla. This massive East Coast snowstorm buried northern Virginia to southeast New York under 18 to 36 inches of snow. Called Snowzilla in the D.C. area and Winter Storm Jonas by the Weather Channel, it was the most prolific snow-producer in the region since the Blizzard of 1996. It ranked among the top five biggest snowstorms on record in Washington and Philadelphia and as the biggest on record in Baltimore and New York (depending on the observing location). The storm also caused severe flooding along the coast of the Delmarva area and New Jersey. Record high tides were reached at Cape May, N.J., and Lewes, Del. At least 55 fatalities were attributed to the storm, with economic losses estimated between $500 million and $3 billion. Of the remaining weather events considered, they were more local in scope. But these additional events are worth recalling for the impacts they had on individual communities — which were devastating in many cases. Like the top four, many involved large quantities of water. In just 12 hours on June 23, thunderstorms unloaded up to 10 inches in Greenbrier County, W.Va., and surrounding areas, resulting in 23 deaths. The Weather Service described it as a 1 in a 1,000 year event. Flooded Greenbrier golf courses on June 24. While the southern part of the state was inundated by floodwaters in August, in early March, 15-20 inches of rain deluged the northern part of the state. Several deaths were reported. Five to 17 inches of rain fell in Houston in less than 24 hours on April 17. First responders conducted 1,200 high water rescues, and seven people died. The storm ended Florida's record-long streak without a hurricane, making landfall near St. Marks, Fla., Sept. 2. Its biggest impact was rainfall. Nearly 20 inches fell in Baskin, just south of Clearwater, leaving many areas flooded. The storm passed through the Southeast causing minor damage. It then threatened coastal areas of the Mid-Atlantic and Northeast as it moved northeastward but remained far enough offshore to offer more of a glancing blow. Total U.S. economic losses are estimated at $800 million. In a mere two hours, six inches of rain deluged Ellicott City, Md., transforming its main street into a raging river on July 30. The floodwaters damaged 141 businesses. The Weather Service described the torrent as a 1 in a 1,000 year event. Cars carried by floodwater smashed into buildings in Ellicott City, Md., on July 30. A massive hailstorm, with stones the size of softballs, hit the Dallas suburb of Wylie on April 11. It damaged 80 percent of the area's 15,000 homes. CoreLogic said Texas hail damage through July was nearly $700 million and that the Wylie event contributed $220 to 280 million. Hail damage in Wylie, Tex., on April 11.